Paul Squires has done an amazing job on the IDE which now has a working visual designer though still in the early stages. the IDE + Designer work a lot like VB so it's very easy to design a working GUI, so I hope some of you will give it a try and hopefully help Paul by finding any bugs. second, download the bug-fixed WinFBE32 from http://www.planetsquires.com/protect/fo ... 7#msg31847 and replace it. Last edited by srvaldez on Jul 19, 2018 8:46, edited 1 time in total. Thanks srvaldez, that was very good of you to post about the advancements made with the visual designer in WinFBE. Still lots of work to do but it's getting better and better every day. All help is appreciated with testing and suggestions for changes, additions, etc. Getting into GUI will probably mean using a few more Windows APIs. Make a copy of the existing database and save as FBkeywords.txt, or whatever. Always a good idea to backup something before replacing it. Now replace with DRkeywords. I won't bore you with how I noticed this but there were some duplicated words in the list. I found an online scanner which removes duplicate words from text files. It took a split second and the entries dropped from 2160 to 2122 so 38 duplicates. Wow! Zip above updated. I am working on WinAPI keyword integration and function codetips. PaulSquires wrote: All help is appreciated with testing and suggestions for changes, additions, etc. there are people, like myself, who don't want to have *any part of it*. PaulSquires wrote: I am working on WinAPI keyword integration and function codetips. At least, I have a opinion. You, obviously not. MrSwiss wrote: You, obviously not. 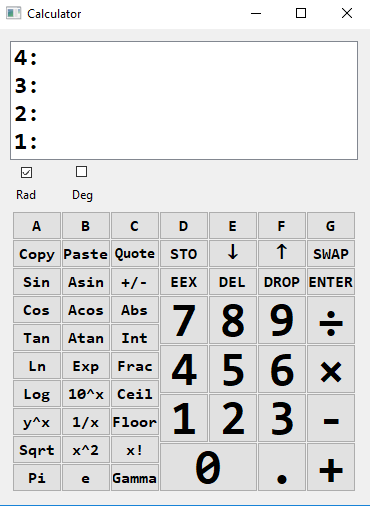 here's simple RPNcalculator, not quite finished yet, no keyboard input yet. Last edited by srvaldez on Jul 26, 2018 21:12, edited 4 times in total. I note that this refers to WinFBE32. I usually use WinFBE64, but cannot get this file to open since the 1.6.4 version of WinFBE. I am using the latest version of Windows 10 home. Is there a known problem? Does the Designer only work properly in WinFBE32? the designer works equally well in either version.